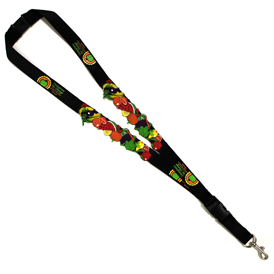 Soft rubber panels turn the typical lanyard into an exciting and fun promotional lanyard. The soft rubber inserts are sewn onto nylon fabric. Perfect for any kind of events, programs, or companies that work with children! 3-D soft rubber design has raised and rounded levels. For different 3-D soft rubber design on each side add $336.00 (G) mold charge. 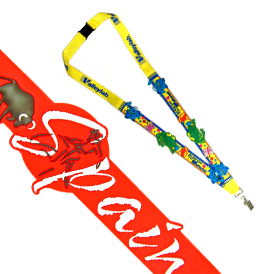 To screen print on nylon lanyard add $0.18 (A) running charge and a $30.00 (G) set-up charge per color. When design on nylon is not printed continuously, but reversed at the neck, add a set-up charge of $30.00 (G) per color. For second side printing on nylon add $0.18 (A) per color with the design the same as the first side. A 350.00 (G) sample charge is refunded upon order placement. Design changes will incur an additional charge. Overnight shipping charges may apply. Pre-payment may be requeired. Adds 10 days to 2 weeks to delivery.